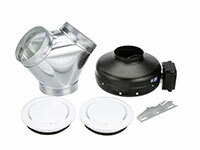 PV-POWERVENT | S&P Canada Ventilation Products, Inc. 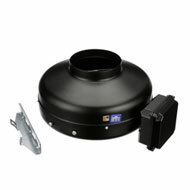 Exhaust air up to 942 CFM with static pressure capabilities to 1-1/2" w.g. All PV fan models incorporate a powerful external rotor motor that has been factory matched to a non-overloading backward curved centrifugal fan wheel. This powerful combination enables the fan to deliver exceptional airflow performances against high static pressure typically found in ducted ventilation systems. All motors within PV fans are fully speed controllable using voltage or frequency control regulators. The PV series of duct exhaust or supply fans have been specifically designed for simple installation and many years of maintenance free operation. 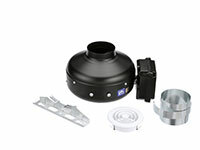 These fans can be mounted at any angle and at any point along the duct. The totally enclosed motor design allows the PV fans to operate in high moisture, lint and dust laden air. All models are manufactured with high quality materials and workmanship that is supported by a comprehensive five (5) year warranty. All PV Fans feature a corrosion resistant galvanized steel casing with black baked enamel coating and are supplied with a strong mounting bracket and prewired junction box. The PV100X fans feature Class F motor insulation. 100 3-13/16" 3-13/16" 4-3/4" 7-11/16" 7-1/2" 4-3/4" 9-9/16"
125 4-13/16" 4-13/16" 4-3/4" 7-13/16" 7-1/2" 4-3/4" 9-9/16"
150 5-13/16" 5-13/16" 4-3/4" 8-7/16" 9-5/16" 4-3/4" 13-1/8"
200 7-13/16" 7-13/16" 4-3/4" 8-3/4" 9-5/16" 4-3/4" 13-1/8"
250 9-3/4" 9-3/4" 4-3/4" 8-1/16" 9-5/16" 4-3/4" 13-1/8"
315 12-15/16" 12-15/16" 4-3/4" 9-3/16" 10-9/16" 4-3/4" 15-13/16"
The PV-POWERVENT Series fans are also available as easy-to-install kits. This ultra-powerful bathroom fan offers a choice of single or dual vent exhaust. 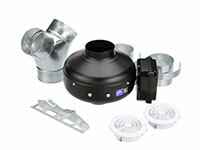 These kits are used for installations that require long or complicated duct runs. Note: All PV kits have standard 8-year warranty.